Now I love having frozen cookie dough on hand. 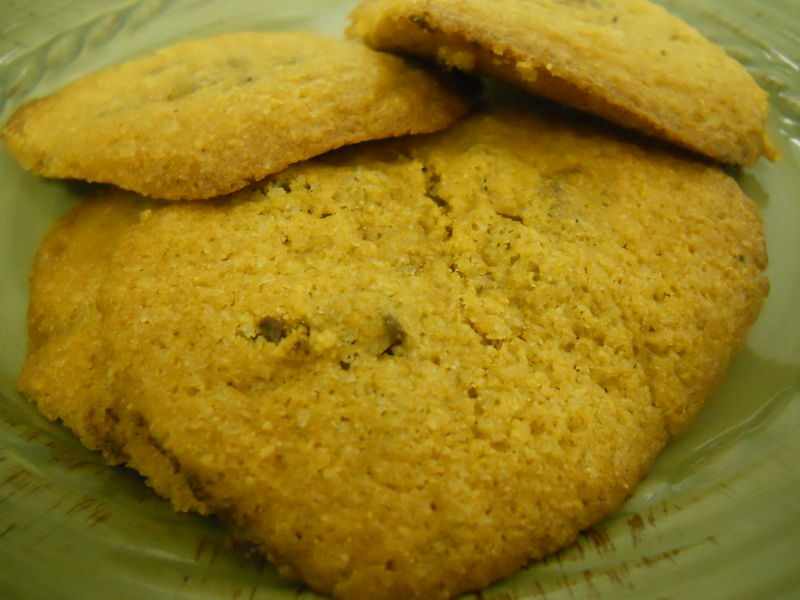 I make a double batch and hide the extra dough from my husband. He would eat it all. Seriously. 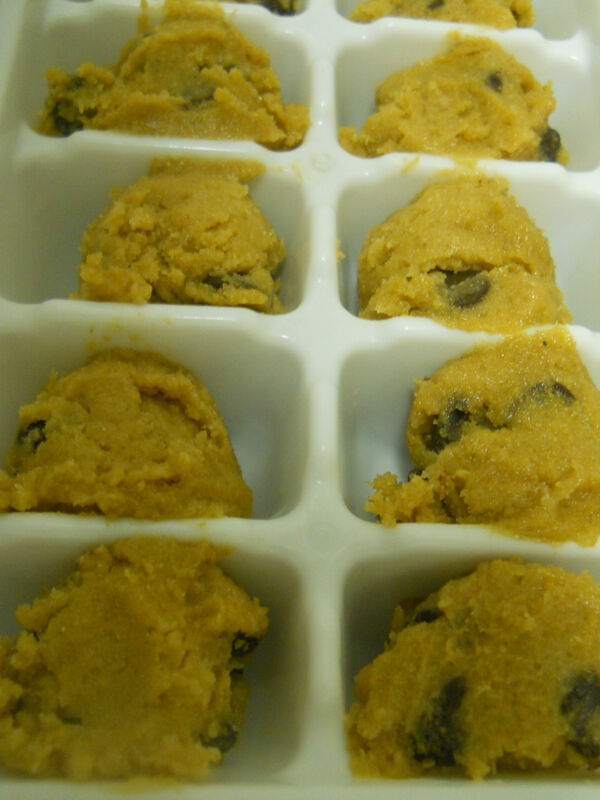 First, whip up a batch of your favorite cookies, scoop the cookie dough into an ice cube tray (one cookie per slot). 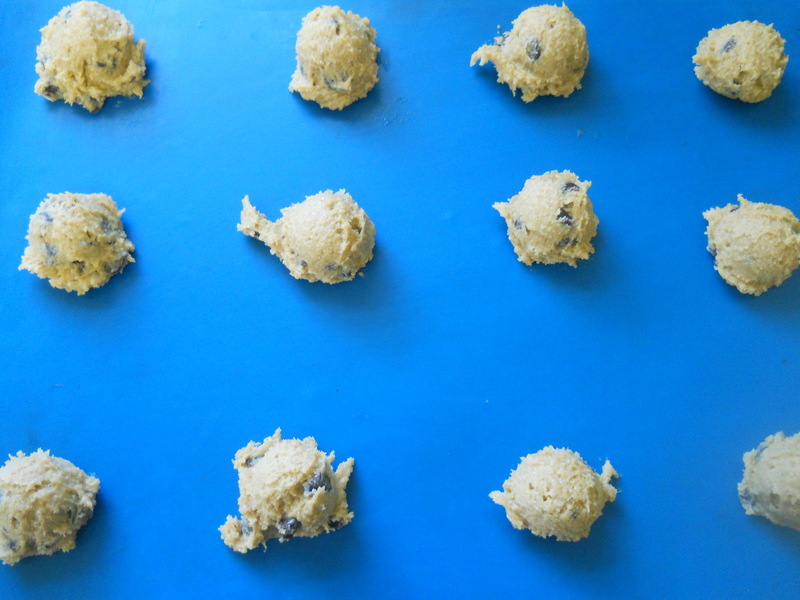 Alternatively, you can place them on a cookie sheet and stick the whole thing in the freezer. My freezer is teeny tiny, so we use the ice cube tray method. Let them harden in there for 24 hours and then scoop them out into a ziploc bag or other freezer storage container. As a side-note, I don’t recommend leaving them in the ice cube trays for weeks. They might get freezer burn and never get over it. Just saying. Then any time the kids whine too much, you have an impromptu date night on the couch, or you just need an afternoon pick-me-up, throw a few, five or six, or, heck, a whole dozen if it’s been one of those days into the oven. You don’t have to defrost them or anything. Follow the recipe directions for time and oven temperature, but add a couple minutes onto the original cook time. Last time I made these, I also rolled some into tiny balls to add into homemade ice cream sometime. I can’t wait to try it. There’s one thing I can’t resist at the fair: kettle corn. You can have your caramel apple and your fried oreos, just give me the largest bag of kettle corn there is. The reason I’m bringing up kettle corn is because I got ambushed by some the other day. I wasn’t at a fair, so it was quite unexpected. My four-year-old was running a race and there it was, calling to me with its sweet, sweet smell. I walked over “just to see” and then I remembered. It’s Eat-In May! Shootfire! as my friend Margaret would say. It would be eating out. So I didn’t buy any. Aren’t you proud? But I couldn’t get it out of my mind. I just kept thinking that I had to have some. . . so I gave in and made my own. I’m happy to report that it’s delicious and totally satisfied my craving! 1. Add 1/4 c. oil to a medium-sized sauce pot. 2. 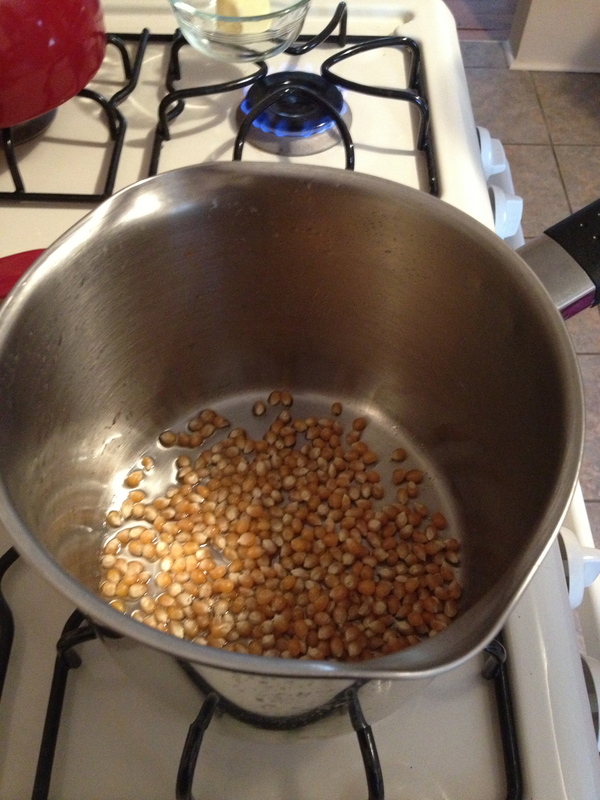 Add 3 kernels. Once they pop, you’ll know the oil is hot enough to add the rest. 3. 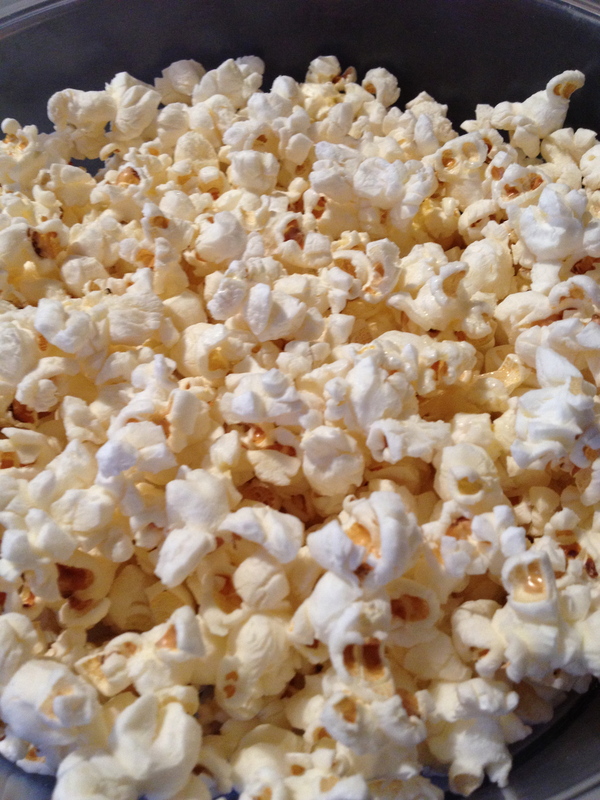 Add 1/2 cup of popcorn kernels. And then add 1/3 cup sugar. 4. Cover the pot with a lid. Don’t put it all the way down. 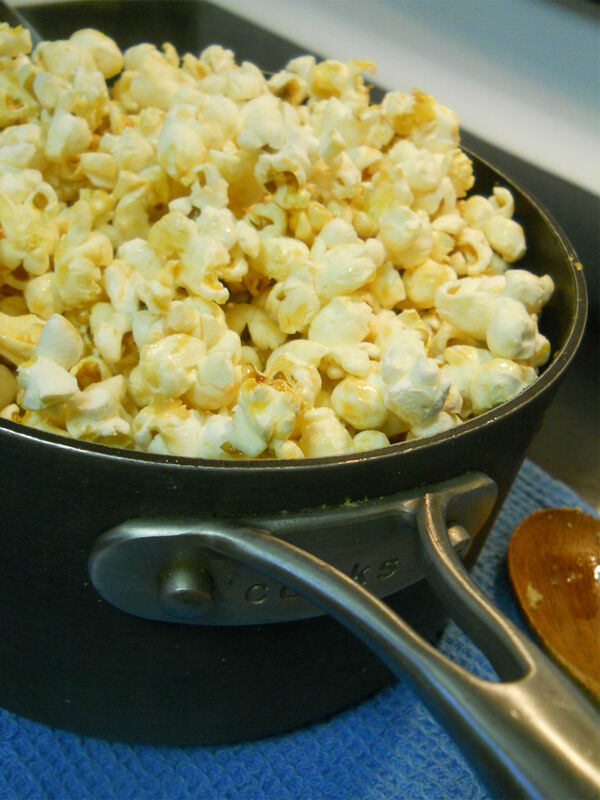 Leave room for some steam to escape so the popcorn doesn’t become tough. And shake what your mama gave you. 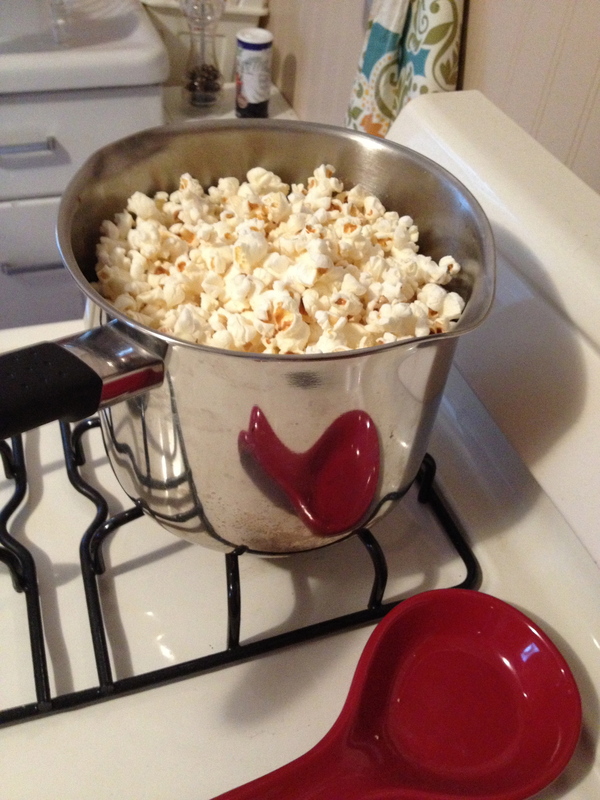 I mean, shake the pot so the popcorn on the bottom doesn’t burn. Continue until the popping slows down. 5. 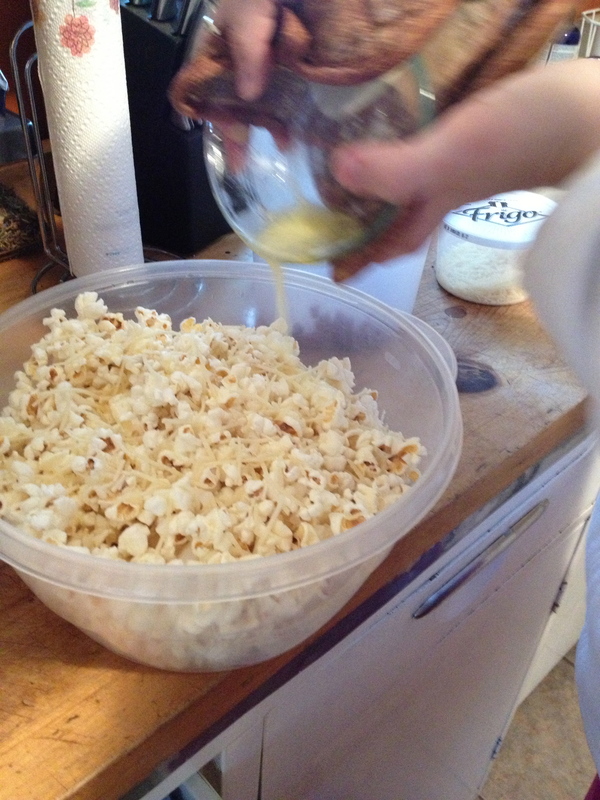 Transfer the popcorn onto a piece of parchment paper. Let it rest for a couple minutes so sugar will harden a bit and give the popcorn that delicious crunch. 6. Enjoy! Try not to eat it all in one sitting. I dare you. 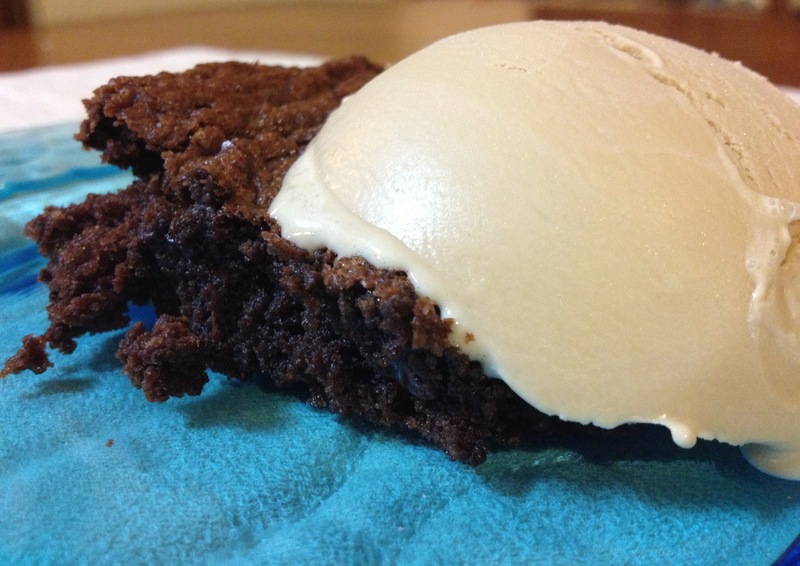 Nothing says decadent like a chocolate brownie with coffee ice cream! It’s quite difficult to achieve the last two in tandem, you see. Dishes without many processed ingredients tend to require more measuring spoons, knives, cutting boards, prep bowls etc. If I’m going to wash all those extra items, there had better be a large quantity of food to show for it–an entire crockpot of soup, for instance. ***WARNING: these brownies aren’t “healthy”–they’re just not processed or prepackaged. Personally, I’m okay with lots of butter! The trick to making this with minimal dishes is doing it in the right order. Here goes! 1. Preheat oven to 350°. 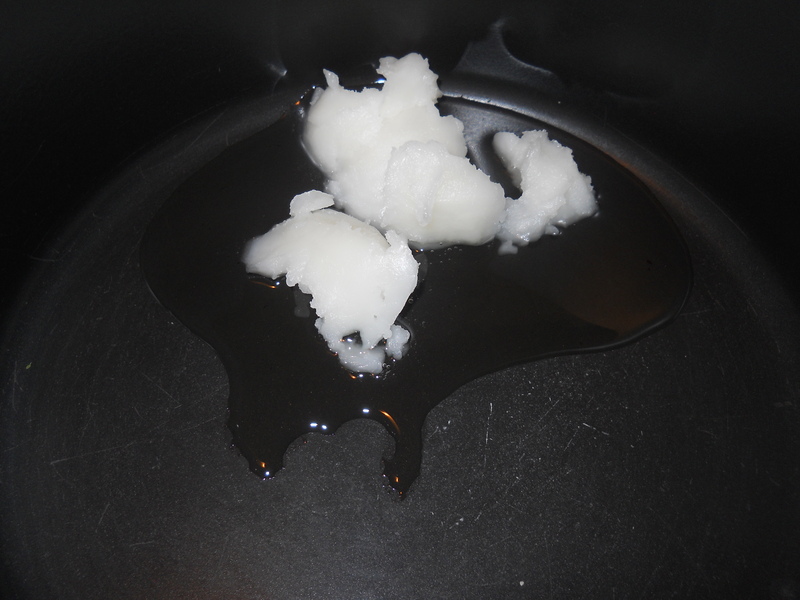 Melt butter in pot on stove over medium heat. 2. 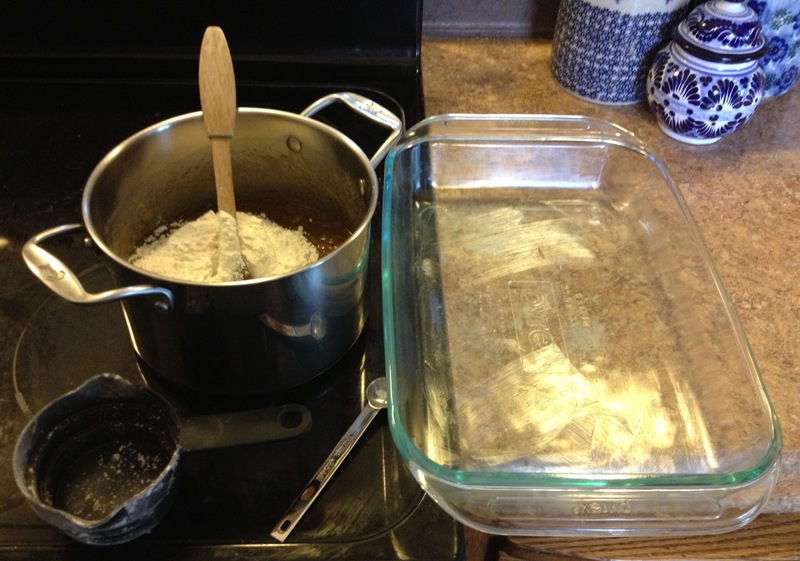 While waiting for butter to melt, rub the wrapper of the butter over your 9×13 pan to grease it. Use the 1/2 tsp. measuring spoon to spoon a little flour into the pan and tap the pan on all sides, shaking the flour around to coat evenly. 3. 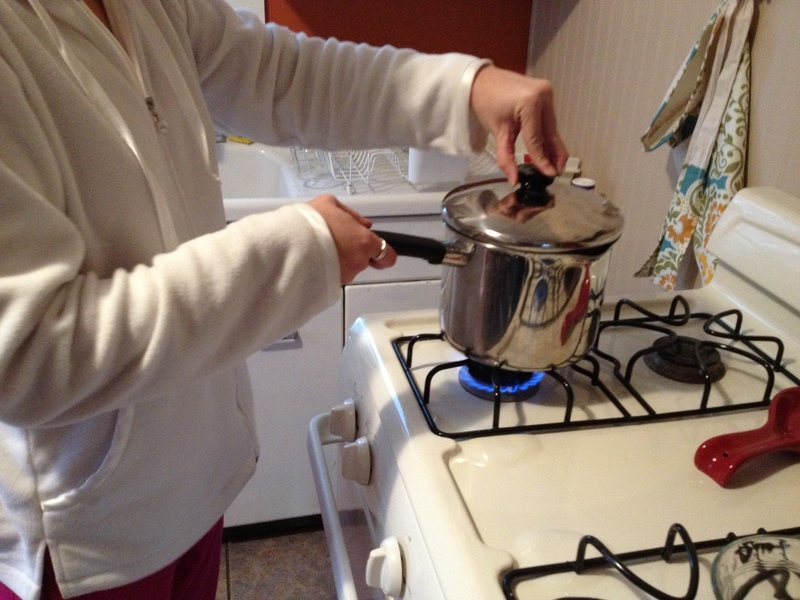 As soon as butter is melted, remove pot immediately from the heat. In 1 c. measuring cup, measure out brown then white sugar and stir into the melted butter (you can use 2 c. brown or 2 c. white to make it easier, but I like the taste of half and half). 4. Measure out the salt in the 1/2 tsp. measuring spoon, then the baking powder, and mix into the pot. Then add the c. of flour (best to do this after the baking powder and salt to make sure those two ingredients mix evenly into the liquid first). 5. Using 1/2 tsp. measuring spoon to help scoop, fill your 1 c. measuring cup almost all the way full of cocoa powder (there’s no need to use a different measuring cup to be exact for the 2/3 c. of cocoa powder…after all, who objects to a little extra chocolate?). Stir in cocoa powder. 6. Add in eggs (the other ingredients will have cooled the warm butter down enough not to cook the eggs…egg particles in brownies = yuck!). Stir in the vanilla, 1/2 a tsp. at a time so you don’t have to dirty another measuring spoon (you can substitute 1 tsp. of peppermint extract for one of the tsp. of vanilla if you’re making mint brownies). 7. Stir in chocolate chips, peanut butter chips, mint chips, or nuts (optional). Pour into floured and greased 9×13 pan and bake for ~20 minutes (until little cracks show on top). 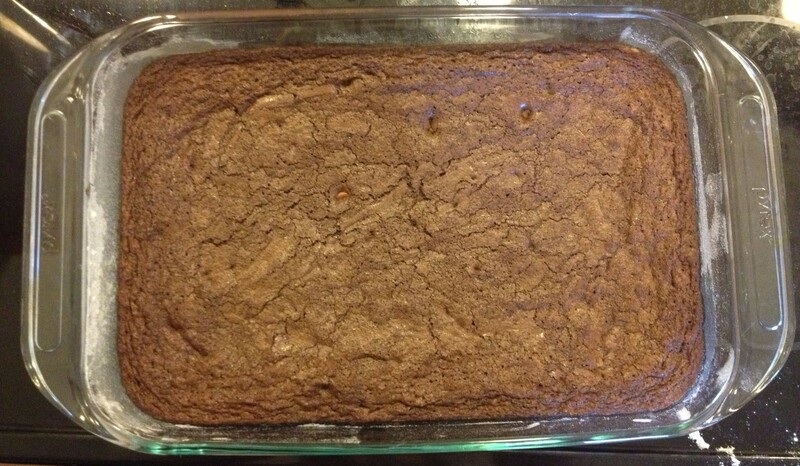 Bake until slight cracks show in the top crust (I burned brownies until I learned this trick!). Now that I’ve made this recipe a few times, it’s almost as fast for me as a box recipe would be. The prep time takes less than 10 minutes, and the dish washing time is the same as it would be for a box. I’m just washing a pot instead of a mixing bowl, and I can feel a lot better about the ingredients! Here is yet another I-meant-to-post-this-in-Deprocessed-December-and-didn’t recipe for those chilly winter evenings. There’s nothing extraordinary about this…other than that it’s something we think will be too much work to make ourselves. 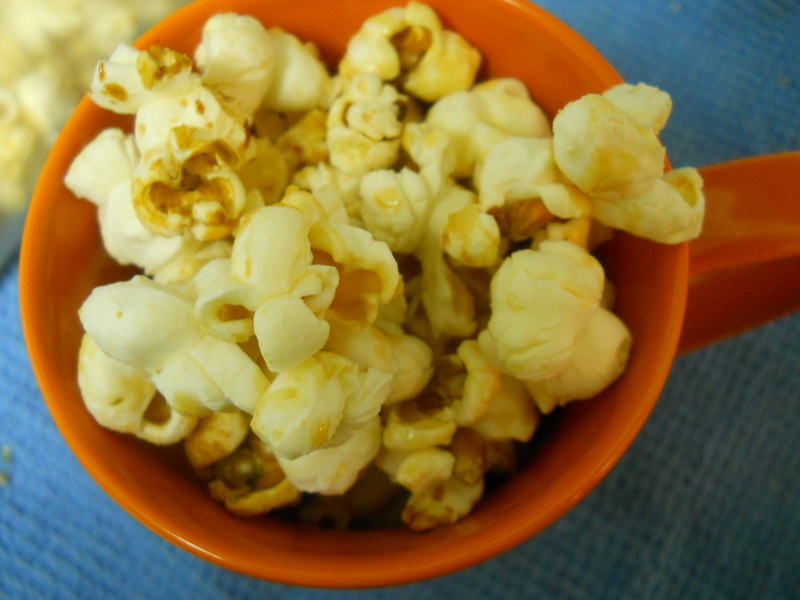 Instead we settle for chemically-laden, microwavable popcorn. Put oil in a tall pot with a lid over medium-high heat. 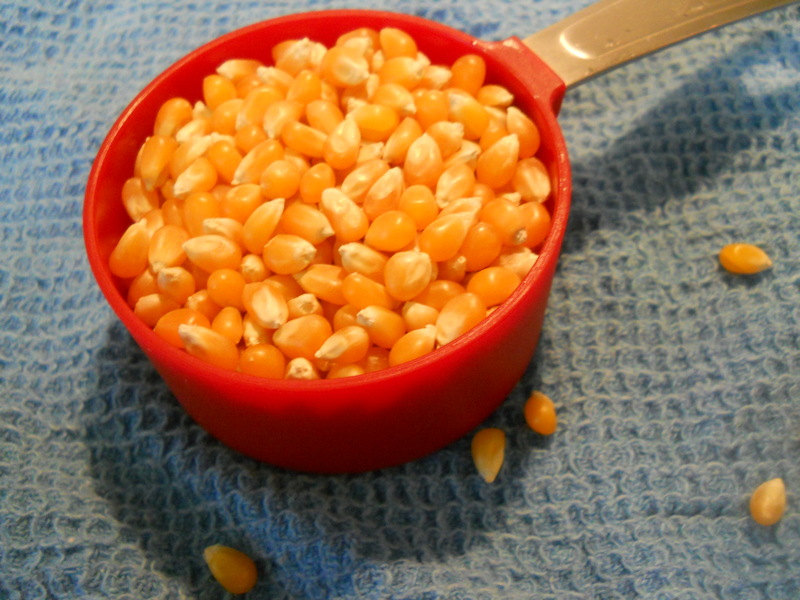 Add corn kernels and cover. 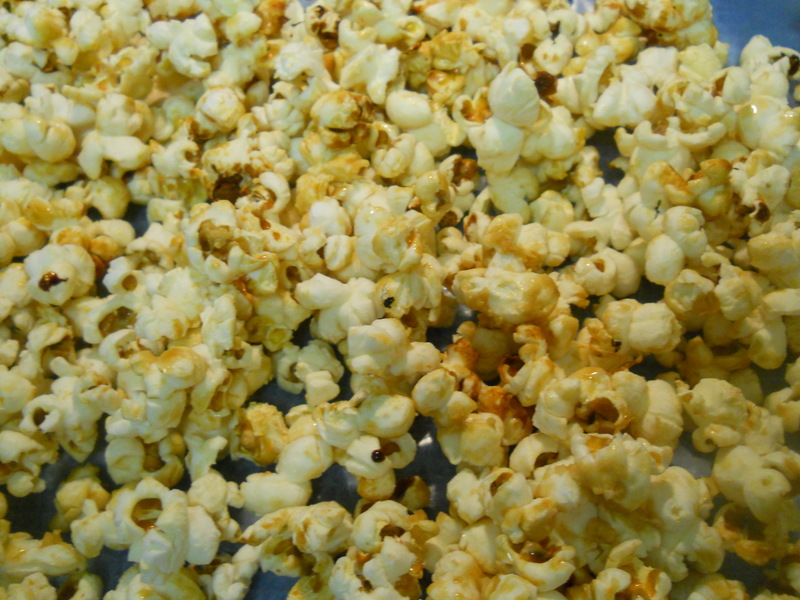 Continually shake the pot a bit to keep the kernels from sticking and burning. When the pot is full of fluffy goodness, you’re done. Top with salt and cheese and butter. Believe it or not, this whole process takes about 5 minutes…ironically, only two minutes longer than the normal popping time for a bag of microwavable popcorn. And the finished product tastes far, far better. 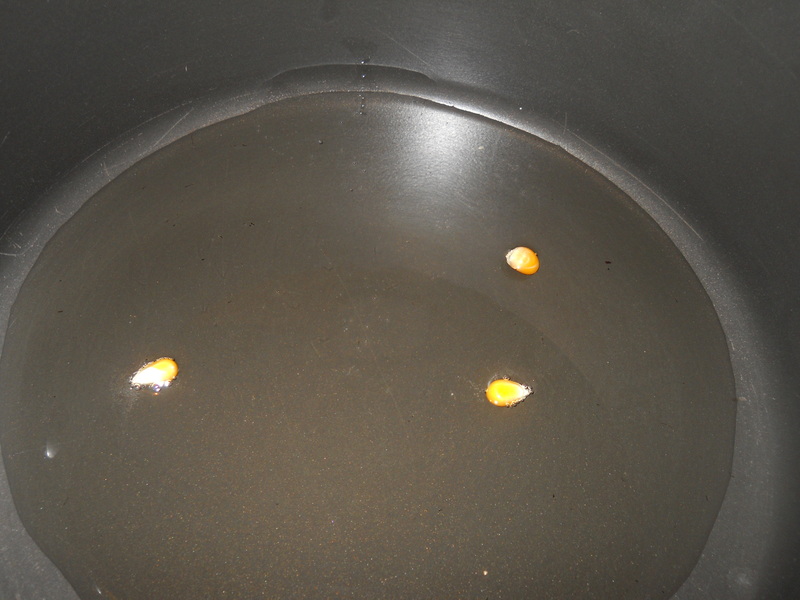 Put oil and corn kernels into a pot. Shake pot to prevent sticking and burning. When pot is full of fluffy goodness, you’re done. Drizzle with butter, salt, cheese…whatever you feel like!